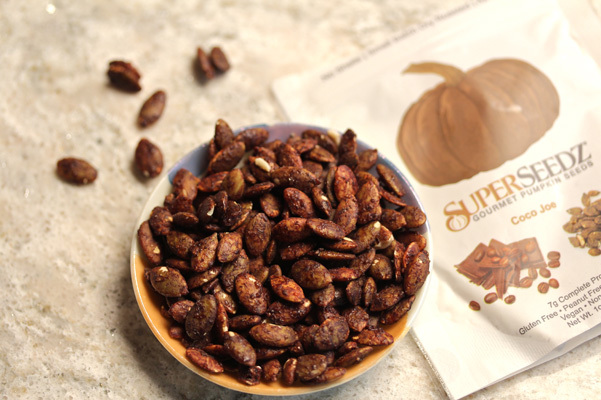 Product Description: SuperSeedz is one of the fastest-growing snack brands featuring 9 flavors of no-shell, dry roasted pumpkin seeds. The newest flavor, Maple Sugar & Sea Salt, as an example, offers 7 grams of plant-based protein, 2 mg of Iron and 2 mg of Zinc in just ¼ cup. All varieties are non-GM0 verified, cholesterol- and trans-fat free, allergen friendly (gluten- free, peanut-free, tree nut-free, egg-free, dairy-free, fish-free, shellfish-free and include soy-free ingredients). Other flavors offer up to 9 grams of protein per ounce. Maple Sugar & Sea Salt: Shelled Pumpkin Seeds, Organic Sugar, Cinnamon, Real Vanilla Extract. Cinnamon & Sugar: Shelled Pumpkin Seeds, Organic Sugar, Maple Sugar, Unrefined Sea Salt, Real Vanilla Extract. Coco Joe: (seen below) Shelled Pumpkin Seeds, Sugar, Premium Cocoa, Coffee, Vanilla, Unrefined Sea Salt. Tomato Italiano: Shelled Pumpkin Seeds, Crushed Tomato, Granulated Garlic, Granulated Onion, Dried Basil, Unrefined Sea Salt, Dried Parsley, Dried Oregano, Black Pepper. Super Spicy: Shelled Pumpkin Seeds, Organic Sugar, Garlic, Unrefined Sea Salt, Cayenne, Black Pepper, Habanero, Red Crushed Pepper. They also offer Sea Salt, Somewhat Spicy, Curious Curry and Really Naked. 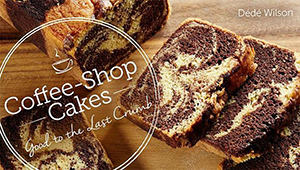 Test Kitchen Overview: We have been on a “plain” cake kick recently meaning we have been indulging in baking pound cakes and simple coffee cakes. (Check out our CRAFTSY class if you haven’t already). They go so well with the fruits of summer and they also lend themselves to tweaks and variations. Chopped nuts are a classic way to add texture and flavor and when we saw the line of SuperSeedz at the Fancy Food Show in NYC this summer our minds immediately went beyond eating them as a simple snack; we could see how much they could add to our baking. They are a line of non-GMO sunflower seeds with various flavors from simple Sea Salt to curry to maple, Italian-inspired and more. Pros: We really like the range of flavors, from sweet to savory and they are all very balanced. You can taste the fresh roasted sunflower seeds and they are complemented by the flavorings, but never overpowered. For instance, with the Coco Joe you can taste the cocoa and the coffee but neither assault your taste buds. You still feel like you are eating a healthy snack – which you are – while getting a little bit of an indulgence. 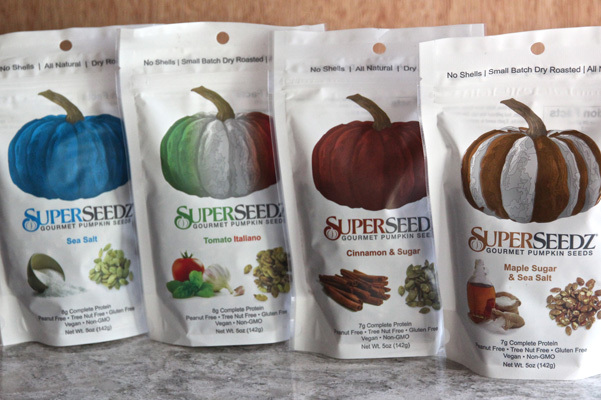 This restraint with flavorings also makes SuperSeedz more versatile as an addition to our baking. Great packaging too. The bags are resealable and we like the simple but illustrative artwork. Cons: Really none. Love the product. Would love to be able to buy in bulk! Suggested Use: Eat as a snack – we love the small 1-ounce snack size for portion control – but also let your imagination run wild. Add them to crumb toppings and streusels. Toss into granolas and granola bar recipes. Use as a base for brittles and pralines. The Tomato Italiano is great on pizza and in salad and on top of savory bread loaves. We added the Cinnamon & Sugar to banana bread and blueberry muffins. We tried the Maple Sugar & Sea Salt in carrot cake. All very successful. Where to Buy: Check out the locator on the SuperSeedz site. 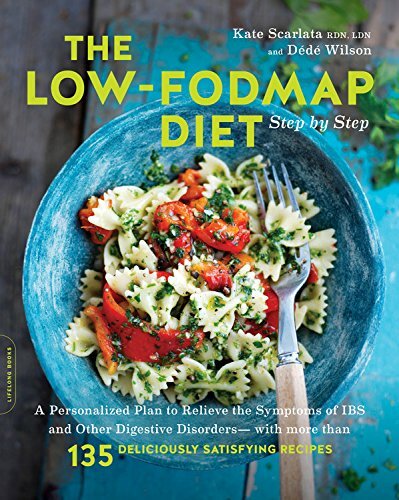 Also look at Albertson’s Big Y Supermarkets, VONS Natural, Whole Foods, Fairway, Stop & Shop and others. Price at Time of Review: 1-ounce two packs from $3.99. Average price for 5-ounce package is $4.99. Have you tried this product? Let us know what you think in the comments below.